People with crappy wireless coverage are suckers for products that promise to fix what ails them. "High power" routers are one cure and wireless repeaters, like the Cisco Linksys RE1000 that I'm looking at today are another. Repeaters can help get some sort of wireless signal into dead spots. But due to the way they work, you shouldn't expect high throughput (more on that shortly). Figure 1 shows the inside of the RE1000. The heart of the design is a Broadcom BCM5357 Intensi-fi XLR 802.11n Router Solution. This do-it-all device contains the processor, 2X2 2.4 GHz 802.11b/g/n radio and five port 10/100 switch. 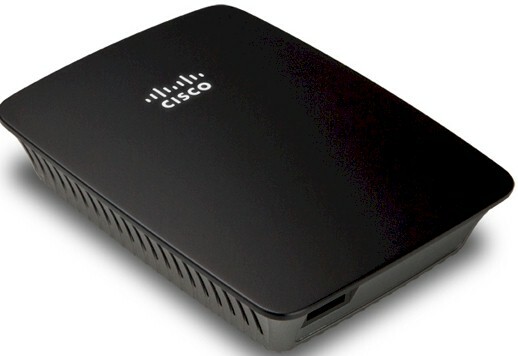 It's also found in Cisco's Linksys E1200 and E1500 routers. The little RF can hides two SiGe SE2598L 2.4 GHz Power Amplifier with Power Detectors. I didn't open my test sample up so didn't see how much RAM and flash it has. If the design is similar to the NETGEAR WN2000RPT I reviewed last fall or the E1200, it would have 32 MB of RAM and 4 MB of flash. I'll note that even with lots of vent slots along each side, the front of the Extender got rather warm during operation. Cisco doesn't ship any printed setup instructions with the RE1000 other than those on the sleeve of the setup CD that they nicely provided. The only CDROM I have is on my desktop machine, however, and you need to run the setup wizard from a Windows or Mac OS machine that is wirelessly connected to your network. I suppose the wireless-connected requirement should have been obvious, because it isn't mentioned on the CD sleeve or Troubleshooting Guide I pulled off the CD or the User Guide I downloaded from the RE1000's support page. The sleeve and Troubleshooting Guides both refer only to "networked" computers. Only when I got part way into trying to install the setup program on my Ethernet-connected desktop did I get stopped cold with a message telling me that I had to use a wireless-connected machine. So I abandoned the wizard and tried the direct approach. I slid off the RE1000's wall outlet prongs (Figure 2) so that I could use the supplied line cord to sit the RE1000 on my desk. After applying power, I checked for wireless networks using a wireless-connected notebook running Windows 7 and found the RE1000 broadcasting its SSID as LinksysExtenderXXXXX, where the XXXXX are the last five characters of its serial number. Connecting to the RE1000 got me a prompt to start a Wi-Fi Protected Setup session using the PIN entry method. I entered the PIN found on the label that you'll only see if you remove the plug prongs, so it's a good thing I did. The WPS session completed after a short wait and I opened my browser (Firefox 5.0.1) to access the RE1000's admin server, which, judging from the IP I pulled, was at 192.168.1.1. Unfortunately, all I could get was the error screen shown in Figure 3 until I tried IE 9, which properly presented the login box and the admin pages, upon login. Once I was logged in, I found the Wireless > Site Survey page, selected my network SSID and then my wireless security passphrase. Of course, once I did that, the SSID I had assigned to the RE1000 during the WPS session was replaced with my main wireless network SSID. So I had to log into my main router's admin server to look up the RE1000's new IP address before I could get back to browsing through the rest of its admin features. Note that after setup was completed, I was able to access the RE1000's admin server with the formerly-failing Firefox. I then decided to take a second run at the wizard by first connecting my notebook to its normal wireless connection and downloading the installer from the RE1000 support page. This process ran uneventfully and I've documented it in the gallery below. But an odd thing happened at the end of the process when I clicked on the Network connection tray icon. Try as I might, I could not bring up the normal network selection box when I left-clicked. I still was able to right-click to open the Network and Sharing Center, where nothing seemed amiss. But when I brought up the Wireless Network Connection Status window, the Wireless Properties button was gone! Disabling and re-enabling the wireless adapter brought back the Wireless Properties button. But left-clicking on the the wireless connection tray icon still produced nothing. Only after a complete reboot did I get back normal operation. So I don't know what juju the RE1000 installer is working, but it should be more well-behaved. Not much here. You might want to set a static IP so that you know where to find the extender.